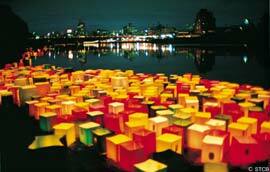 Lanterns flowing down a river to give comfort to the departed during Obon. Photo Courtesy the Sendai Tourism and Exchange Office. Obon, formally called urabon’e, is an annual holiday as important as New Year’s in the Japanese calendar. Obon is a Buddhist festival to comfort the souls of the dead and the family ancestors, and to pray for their attainment of Buddhahood. The obon season falls in either July or August (depending on region), between the 13th and 15th. During this period, the spirits of ancestors return home. Families prepare for the returning spirits by cleaning the family gravestones, setting up offering shelves next to the household shrines, and inviting monks to chant prayers called sutras. The spirits arrive on the evening of the 13th, and families light welcoming fires in their front gardens to guide them. On the night of the 16th, a farewell fire in the same place lights the spirits’ return path. In late August and July, bon dance festivals are held all over Japan. Merrymakers dressed in cotton summer kimono dance to sounds of taiko drums and bamboo flutes. At the finish of the festival, candle-lit lanterns are sent floating down rivers or out to sea, to guide the spirits back and ensure their well-being.